I'm not complaining, but I'm fairly sure that you shouldn't need THIS kind of map to navigate your speeder bike! Force sensitives can go over the edge in many, MANY, ways. When a mind taps into the raw power of the force, it reinforces the mental patterns associated with that use – burning them into the mind and making it easier and easier to draw on the force in pursuit of those patterns. With caution, and a code, moderation in it’s use, and constant self-discipline, you can use the force and maintain your sanity. Sadly, few force-sensitives can manage that without training. Without training you can fall to ambition and the will to power. You can fall to anger and the desire to destroy. You can fall to jealousy and envy. You can fall to greed or to the desire to manipulate. Such patterns are easy, unsubtle, and already inclined to the extreme – and such are the adepts of the Dark Side. At its core, the madness of an Artificer is simply good old garden-variety obsession; the force feedback loop has simply carried their focus on their research to heights of insanity that no normal mind can reach. They’re the stereotypical mad scientists of the Galaxy. How much of that is true madness and how much is just being absent minded and hyperfocused on the task at hand largely depends on the individual and on the extent to which the force has control of their behavior. To understand an Artificer, one must understand his or her Project. Thanks to their precognitive abilities, an Artificer’s project is always something POSSIBLE. That’s not the same as practical, affordable, or even sensible – but it’s vaguely possible, even if the odds are a few trillion to one. Projects can range from the utterly mundane (catalog all possible uses for duct tape!) 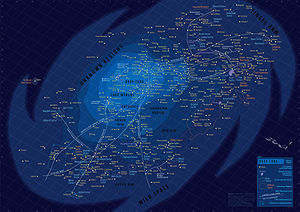 on through a complete analysis of hyperspace, fully automated manufacturing facilities, finding ways to transfer minds into immortal mechanical bodies, creating new weapons, building dyson spheres, or engineering the ultimate plague. Some projects are quite innocent, or even helpful and useful. Still, regardless of how harmless a Project may appear to be at a glance, it is the singleminded obsession that makes Artificers dangerous. It doesn’t matter if some experiment is not a good idea – or if it might wreck a city, or unleash a galactic war, or blow up a city. All that matters is that it advance the research and leave the Artificer around to consider the results. They’re impatient too, and inclined to throw things together with the force rather than tediously setting up a proper experiment. Trying out a new hyperdrive configuration is all well and good, but trying it in the middle of a crowded city may not be the best option. Still, as far as Sith go, the Artificers are often tolerated, and sometimes even supported. Such dedicated researchers are not easy to find – and most of them just need someone to watch over them and make sure to remind them of the potential consequences of their actions before they try something. Indeed, with proper use of suggestions and steering a train of thought, an Artificer can often be persuaded to assist with any problem related to their Project. Artificers tend to travel in groups. Not out of any sense of belonging, but because it means they can borrow spare parts and tools from each other. It is actually rare to see more than one cooperating on a single project though – unless the potential reward would apply to each of their personal Projects in turn. One can expect Artificers to be able to pull off weird stunts no one in their right mind would attempt and to have a gadget for every occassion (regardless of how relevant). Thanks to their focus on mechanisms and devices, Artificers suffer a -3d penalty on their use of force Manipulation and Control unless their target is a machine or device of some type. They suffer a similar penalty on all normal “social” skill checks. They may, however, distribute their Manipulation dice (and any relevant dark side dice or speciality dice) amongst the characteristics of any machine(s) they happen to be carrying, using, or operating up to a maximum of one-half that dice pool invested in any one function. Thus, if one happens to be piloting a Starship and had 8d to distribute, he or she might add +2d to the main weapon, +3d to the shields, and +3d to the speed. Like most Sith, Artificers are always crazed obsessives, and will need to make will checks to pull themselves away from their studies to address other situations – or to resist appeals to their particular manias.